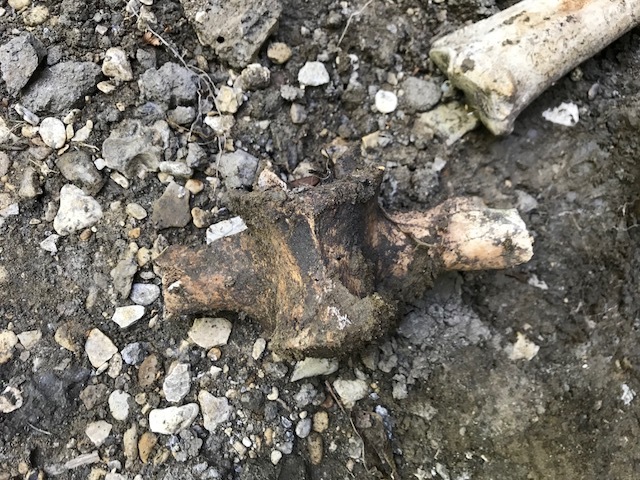 Ok as if the clam wasn’t enough excitement for the day, not that this is exciting I also found what I believe is a very old, but modern cow skeleton, which I believe is most likely fully articulated. I just want to confirm it is cow. I went fossil hunting yesterday, which was almost a complete and total bust for me. Rarely happens, but that was the case fossil wise. However that does not mean I didn’t find some really cool, very, very cool, want so badly kind of stuff, but I couldn’t carry them out because they were too big and heavy. Anyway, it was miserably hot. I believe I found the hardest, most difficult, poison ivy overgrown path I could possibly find into the creek. First attempt was a 25 foot drop straight down into the creek. 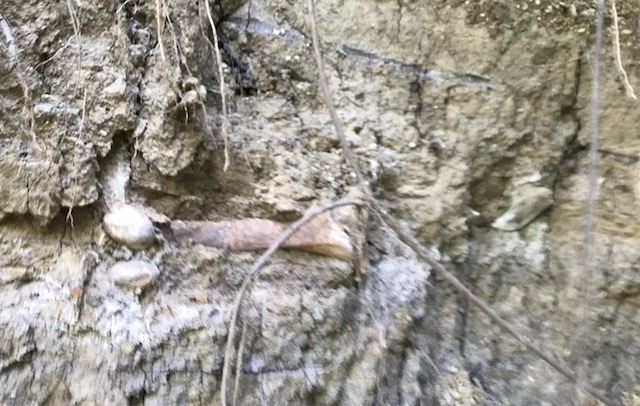 I scouted a small section of the creek out, found lots of very cool stuff, but only a coupe of oysters and that was it fossil wise. I was hot and wanted to check out another place before dark so I looked for an easier way out. I found one I thought I could manage. Problem was I was in my flip flops. I had no traction. If I’d been in my boots I’d had no problem at that spot. I couldn’t make it so I went further up creek. The creek water was like warm bath water and offered no relief from the heat. I came to a spot in the creek where a pool of water was divided off from the sandbar. I stepped into it and too my surprise the water was cool and sooooo refreshing. I splashed it all over myself to cool down and walked on. I walked maybe 10 feet and saw this on the edge by the creek bank. It seemed to have recently fallen about 4.5 feet from the middle of the creek bank above. There was a large clump of bank to the right that had more bone in it. I have to mention that I was a few hundred yards from a cemetery so it gave me pause. I had to process it a moment and determine that these were not human bones. Wouldn’t that be horrible! The cemetery could be 100 yrs old. The creek changes course over the years and encroaches upon the cemetery and graves start washing out into the creek!! Yikes! I’m sure it must have happened somewhere once upon a time. Didn’t happen here though. Moving on. This was embedded in the bank about 4.5 feet from the portion of the creek I was standing on and about 5 feet down from the top of the bank. No way it could have been redeposited since it seems largely articulated. I’d been seeing concretions in the bank of the creek so initially I thought the ball to the right was a stone. I was taking a pic of the broken bone. Rib maybe? The ball and one above it I think are heads of femur or something. Here is the bank. You can’t really see the other bones in the bank in this pic. They are there though. Bad quality pic, but I removed some of the dirt from the bank to expose the bone. There is more bone to the right and left. Some of the bones that had fallen from bank. Anyway, do you think it is cow or could it be bison? That’s about all the pics I have. It’s modern, but I’m curious. I am assuming the cow must have gotten stuck in the mud and died. The cool water in the creek had to be coming from an underground spring. This was maybe 10 feet from there. 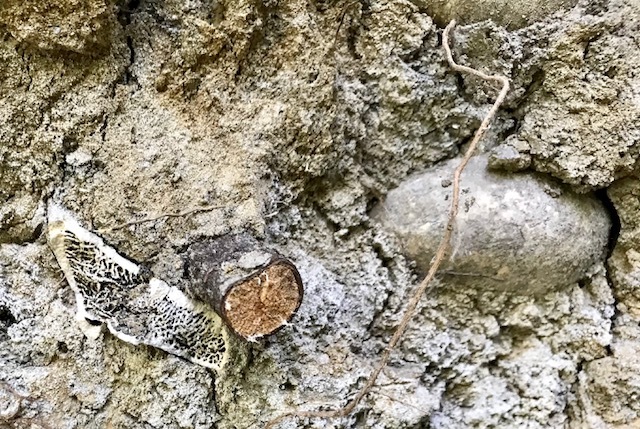 Maybe it made the soil very soft and contributed the the bovid’s demise. 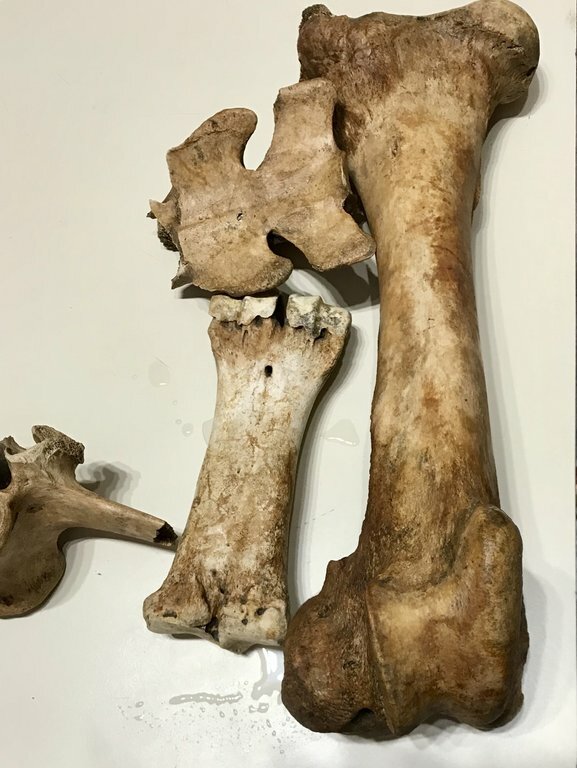 I have come across cow skeletons on numerous occasions that died in a field and are completely disarticulated from wild animals scavenging them. That didn’t happen here. It must have been mud or something. Thanks for the "neo-paleontological" report @KimTexan! A tooth would be better for identification. Being Texas it could be bison. 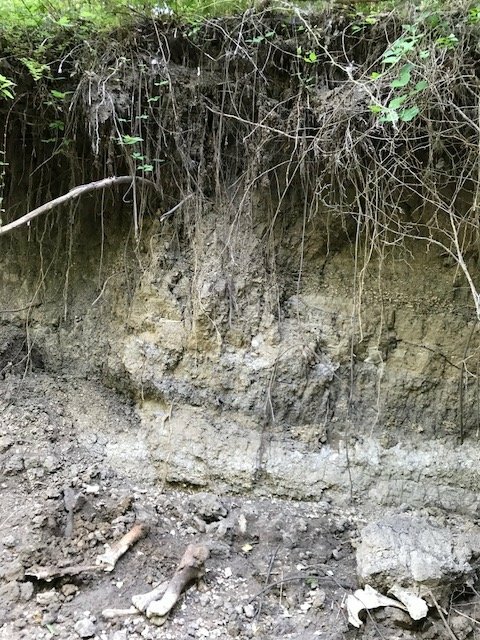 The bones are deep in the stream deposits, could be a few hundred years old. 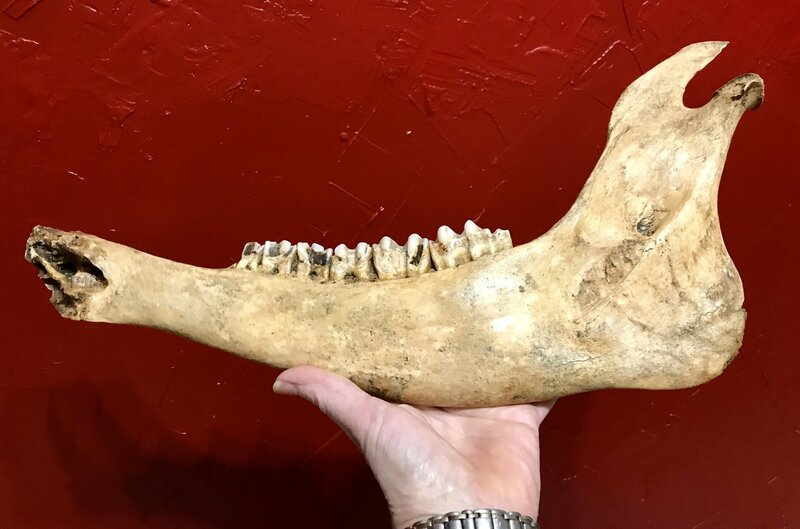 Bison and cow teeth have differences but long bones look much the same. I did not dig into the bank for more bones. I definitely saw more bones in the bank. I’ve considered going back next weekend. I’ll be in the general area on Saturday and Sunday and could swing by. The creek seemed to have some traffic in that specific area so it could be gone by then. There weren’t too many farmers living in Texas 200 years ago, but there were a few. I’m a 5th generation Texan. My great-great grandmother was born in Texas 162 yrs ago. The settlement of Dallas didn’t start until 1841. I imagine Dallas started as a result of the congress of the Republic of Texas voting to build a road from Austin to the Red River in 1838. 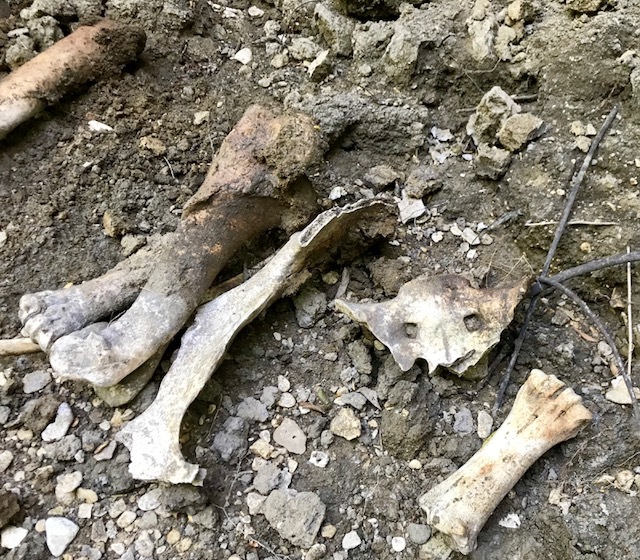 I believe part of the original trail ran within 1/2 mile of where I found this skeleton. Land was owned by a railroad company until 1902 when the railroad company auctioned. That would make the cow probably only 100 yrs old. It could have been a bison. If so it may he older. Of course the history of the place isn’t definitive that it wasn’t occupied prior to 1902. My daughter and I headed out there Monday after I got off work. I had an appointment about 15 min from there. Poor girl has got a crazy, wacky, non-typical mom. As we drove there we talked about what we might tell our friends the next day. We joked that we’d tell them we went grave digging last night or dug up a body, pausing momentarily before saying it was from the body of a cow. She loved it. She had so much fun. We dug away at the bank and she pulled out the 2nd femur and exposed part of the pelvis. She thought it was really cool. I thought she’d probably never have such an amazing opportunity to learn mammalian skeletal anatomy. I always learn so much more when I’m able to see, feel and touch. I learned a bit more about skeletal anatomy too. Initially I had thought the skull was to the left or East. After I saw her femur I wrongly assumed the skull was to the right, because I didn’t know that the condyles were on the posterior side of the femur. I’d just never had to think of it before. 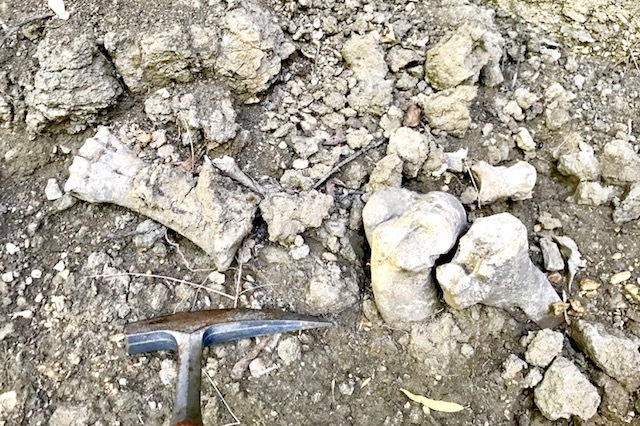 The femur I found had fallen from the bank already as had the sacrum and sacral vertebrae. We dug for a bit, but the bank did not look stable to the left of the femur. I deemed it unsafe to be digging there. A few hundred pounds of the bank looked close to falling down. I needed different tools to assist it in its fall and be safe. I think that’s about it. 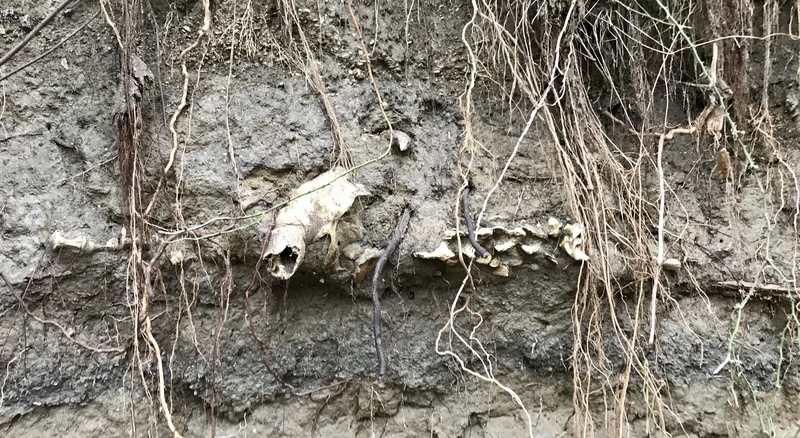 There must be some more bones in the soil that fell from the bank. There is definitely some left in the bank. I’m not sure I’ll be able to get it out due to the amount of overburden and the presents of small trees and shrubs on top of the bank. I’m not sure I want to recover everything. I don’t know what I’d do with it. I haven’t cleaned everything up yet, but here are a pic of some of it. 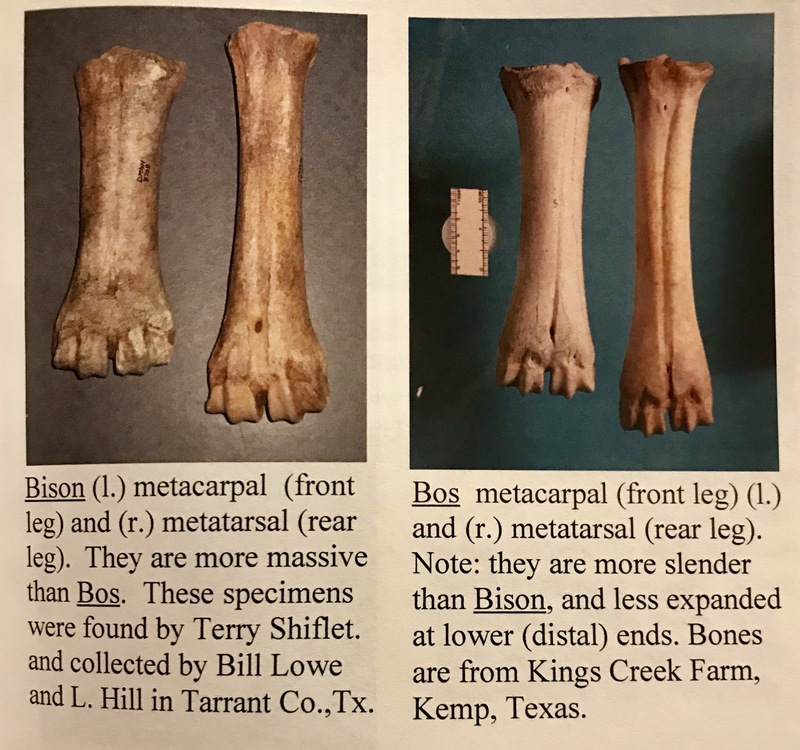 This is a great resource for distinguishing bison from bovine post cranial bones. Sorry, I can't remember off the top of my head who provided this link to me. The credit is embedded somewhere in this wonderful forum. The bones you're pulling out of there look to be in good enough condition to have some of the diagnostic features needed to identify which beast it is.  If you can't click on this link, just copy and paste it. This is in the book. This is one of my bones. 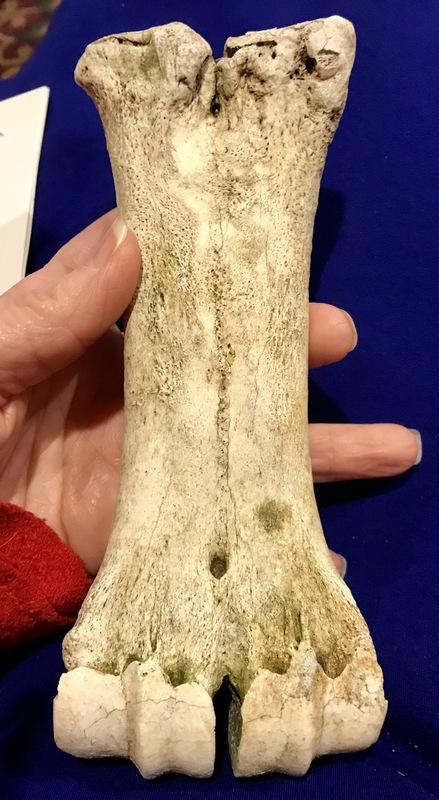 That is a bison metacarpal my friends! Woohoo!!!! I’m am thrilled. Now I’m just upset with myself that I didn’t go back and try to get more of it. I went back out to the sight this afternoon. This is what met my eyes. I think it’s the whole enchilada. I worked on excavating it for 3 hours and after nightfall. I posted something on DPS FB group with lots of pics. Vertebrate fossil find of the month candidate. Part of what did make it home with me. This is is my FB post.